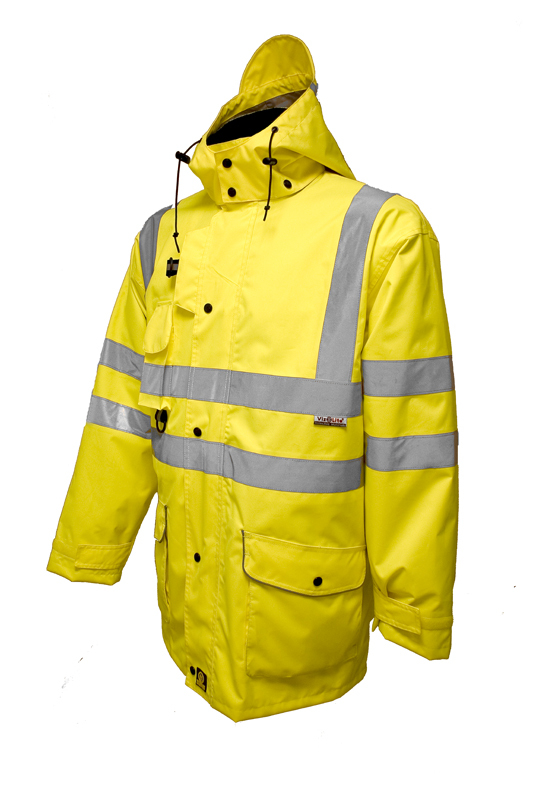 Premium high visibility garment, featuring breathable waterproof raincoat with fleece lined inner body warmer. For excellent comfort and protection in all conditions. Inner garment features: Front mobile phone pocket with flap, D ring, 2 front angled pockets, quilted lining and zip out quilted sleeves. Outer garment features: Front mobile phone pocket with flap, D ring x 2, Velcro adjustable cuffs, detachable peaked hood, fleece lined collar, studded storm flap, front patch pockets with reflective flaps, hand warmer pockets and breathable shower proof fabric. Conforming to BS EN471:2003 Class 3, 100% Polyester fabric with VizLite™ 100 Series Reflective Tape.